1917 | LABOR PAIN ON THE TRAIN! Wobbly leader arrested after Great Northern train brawl! Amidst the backdrop of World War I, and as great swaths of the West were burning, more than two dozen firefighters boarded a train to take them far from Western Montana's then-fiery landscape. But before Great Northern passenger train No. 3 arrived in Spokane, a wild fight broke out in one of the cars. Whatever had caused the ensuing "drunken brawl" was considered, however, less crucial to authorities at the time than the affiliations of at least one of the men involved, a fellow named Eugene Delvoye. 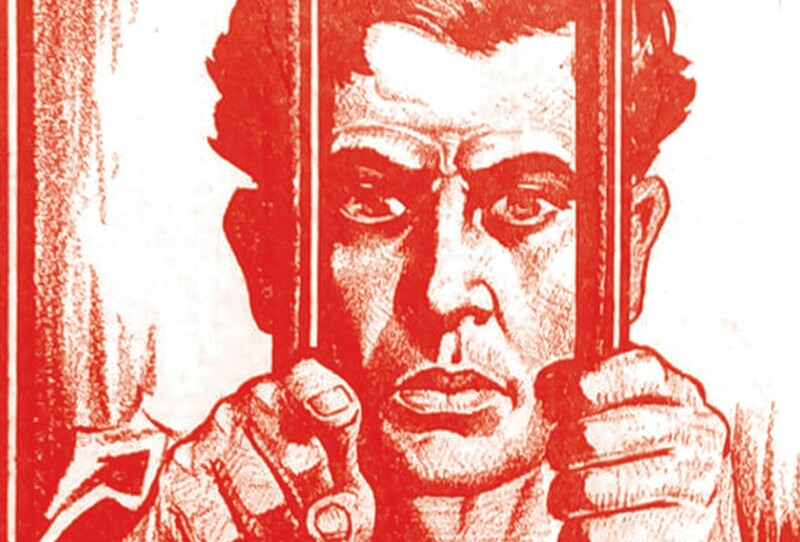 Delvoye openly told arresting military authorities of his active involvement with the International Workers of the World, also known as the Wobblies. Threats of violence on behalf of the "Wobblies" — a union of unskilled workers who often employed disorderly tactics when voicing demands for better working conditions, hours and treatment of the working class — were not unheard of in the decade surrounding this particular event. Eight years earlier, in 1909, a Wobbly-led free speech battle dramatically unfolded in Spokane's streets and jails, led by the fiery young Elizabeth Gurley Flynn. Just weeks before this Great Northern train brawl, the Wobblies threatened massive labor strikes in industries across Washington state, including agriculture and lumber, prompting a short-term military occupation of Spokane and a declaration of martial law from the state's governor. Card-carrying I.W.W. workers were subsequently rounded up and jailed. So when a confessed Wobbly organizer was arrested in a train brawl, authorities were naturally suspicious. While most of the 27 arrested men were released days later for claiming that they were merely spectators, Delvoye was thrown into the Spokane County Jail. There, he then exercised his First Amendment right to openly curse Old Glory in front of other imprisoned I.W.W. members. Considered a vile scandal, this detail was dramatically reported by the Spokane Daily Chronicle as an indication of Delvoye's "vicious disposition." The specific spark of the train brawl remains less clear in accounts of the incident, though it was reported that a Great Northern special agent expressly ordered to provide security aboard the train had his "special sheriff's star" revoked for participating in and encouraging the fight. The agent became intoxicated along with the group of firefighters, and allegedly pulled his gun on another deputy sheriff asked to board the train in Libby, Montana, by railway officials who were, perhaps justly so, wary of trouble from the firefighters. The original print version of this article was headlined "1917 LABOR PAIN ON THE TRAIN!" 1858 | TRIBES TELL STEPTOE TO STEP OFF! 1882 | CANTANKEROUS COOK FENDS OFF EXPLOSIVE CANNON! 1892 | CUCUMBER PETE'S PUNCHES PRODUCE PISTOLS! 1899 | LAST STOP FOR THE DYNAMITE EXPRESS! 1909 | PRESSMAN PUMMELS POL OVER BOOZE VIEWS! 1976 | NOR'WESTER FESTIVAL GETS LIT! April 27-28, 7:45 a.m.-12 p.m. & 12:45-5 p.m.